Ends of the Earth was formed by Janet Willoughby in 1987 with the intention of assisting the survival of traditional crafts, everywhere threatened by industrial development and modern life. Ends of the Earth has sought out those areas in the world where people have been able to sustain traditional methods and techniques. After 20 years Ends of the Earth has built an impressive collection of examples and established links with traditional craftspeople in many countries. Janet hopes to assist in the survival of this vital cultural heretage in three ways: by making traditional work available for sale and exhibition, by producing DVDs showing the techniques and culture that produces the work and by organising hands on tours where enthusiasts can experience and study the cultures and techniques. 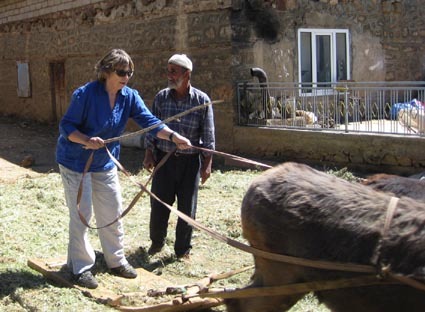 Janet operating an old fodder cutting machine in a mountain village during the Turkish Textile Experience Tour last June 2009.